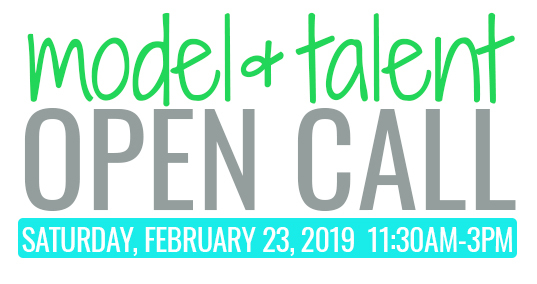 Join us at our Model and Actor Open Call! The Rock Agency is seeking new talent, ages 3-16 years of age! The Rock Agency represents fashion and commercial models, actors and artists serving all media including: print, runway, TV commercials, industrial videos, voice-overs, fit modeling, show room, promotional modeling, trade-shows, and feature films. Meet Laura Alexander, Director of On Camera and Kids at The Rock Agency. February, 23, 2019 from 12:00-3:00pm at Nicole Thomas Photography, located at 1942 Lehigh Avenue, Suite D in Glenview, Illinois 60026. A priority spot will ensure that you are seen by the agency director prior to "walk-ins". Click this form and fill out the information to reserve your priority spot! Please bring two to three non-returnable photos, a comp card or a headshot. If your child would like to be considered for TV/Film/Commercials they must prepare a one minute monologue. If they are interested in modeling, no experience is necessary. If your child is signed with another agency, there is no need for you to come to the open call as The Rock Agency is an exclusive agency. Additional questions: Please email or call us at (847) 729-4466. Special Event Sessions: Saturday, March 16, 2019! Are you interested in booking a photo session? Join us on Saturday, March 16, 2019 for our special Model Comp Card / Actor Headshot Photo Sessions. Click here for more information. You don’t have to be a model or actor to join us on Saturday, March 16th. We will be doing professional headshot photo sessions as well. Click here for more info.